Relentless anticommunism defined the late Richard Pipes as more propagandist than historian. 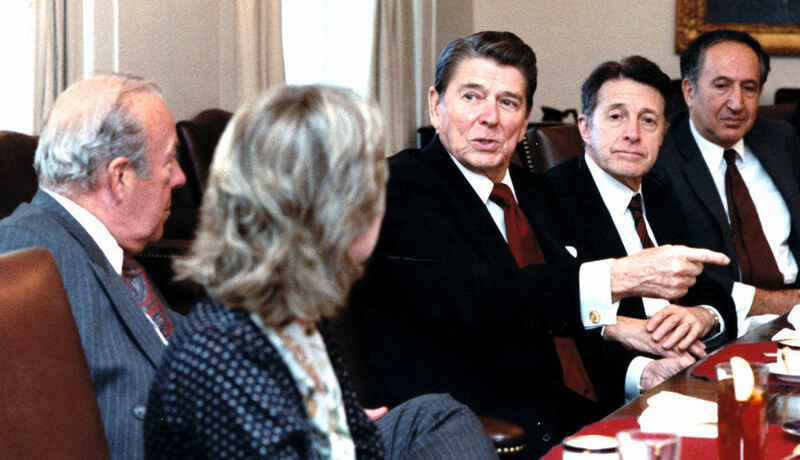 Richard Pipes (far right) with (from right) Secretary of Defense Casper Weinberger, US president Ronald Reagan, and Secretary of State George Shultz, November 1985. Richard Pipes, the most prolific of a generation of anticommunist cold warriors, has died. Author of twenty-seven books, Pipes was also a nuclear weapons consultant to the Central Intelligence Agency and a National Security Council advisor to Ronald Reagan. In Vixi: Memoirs of a Non-Belonger, Pipes attempted to portray himself as a nonconformist outsider. But the reality of his career was quite different. Harvard, where he was a graduate student and then professor, was the preeminent anticommunist Cold War think tank with a level of ideological conformity that mirrored its state-sponsored Soviet counterpart. Cold warriors moved easily between intelligence jobs and academic posts. The head of Harvard Russian Research Center, Abram Bergson, worked for the Office of Strategic Services (the precursor to the CIA) and the center supported the FBI’s hunt for subversives. The Cold War “enlists everyone and calls upon everyone to assume his part” and “the historian is no freer from this obligation than the physicist,” implored the head of the American Historical Association. Pipes was more than willing to do his part. In one of his first books, Social Democracy and the St. Petersburg Labor Movement, 1885–1897, Pipes made the astonishing summation that workers were so uninterested in socialism that a frustrated Lenin later developed the “un-Marxist” and “Blanquist” theory of “revolution from above” by intellectuals that would later guide Bolshevik practice. Relentless anticommunism defined Pipes as a propagandist rather than historian. More talented cold warriors would occasionally admit the obvious, such as Robert Conquest, who conceded that the Bolsheviks won “the bulk of the working classes in the cities.” Pipes, however, wrote only for the ideologically converted and rarely made factual concessions that undermined his political mission. Nor did Pipes engage with his critics such as the social historians of the 1970s and ‘80s who displaced the anticommunists. The new social history by scholars such as Alexander Rabinowitch, Ronald Suny, and David Mandel had replaced the simplistic Cold War narrative by placing the actions and sentiments of ordinary workers, peasants, and soldiers at the center of the revolutionary process. Having published five monographs by the mid-1970s, Pipes was recognized as the foremost conservative authority on the Soviet Union. In 1976, Pipes led a group of military and foreign policy experts, known as Team B, to counter the CIA’s own Team A, in an analysis of the Soviet Union’s military strategy and the supposed “strike first” threats they posed to the United States. His principal adversary was none other than Henry Kissinger, advisor to John F. Kennedy during the 1960 election campaign, as proponent of a fictional “missile gap” with Soviet Union that would help propel Kennedy to victory. Pipes also attributed great power to propaganda. As Kenez suggests, “he believes that people do not want what they seemed to want, for their views and therefore their actions have been manipulated by others.” Pipes’s approach is that of an “extremely conservative man”; the only figures in The Russian Revolution not depicted as knaves or fools are the “remarkable exceptions” of General Kornilov and Nicholas II. Conservative pundits have incorrectly depicted Pipes as a champion for democracy —obviously without having read this book. Pipes’s admiration for vile antisemitic warlords was only comprehensible by situating his extreme conservatism as not being far removed from fascism. In Communism: A History, Pipes defended the 1973 US-supported Pinochet coup against Allende in Chile and in April 1996, Pipes told a University of Toronto audience, “Italian fascism wasn’t all that bad.” “I lived there — there was lots of operetta and bad architecture, but it wasn’t much worse than the Poland I’d left in 1940.” In his search for alternatives to Bolshevism, Pipes made no attempt to clumsily invent a “democratic” alternative to Soviet power — he sided openly with the ruling class forces who had engaged in mass repression as a “solution” to the Russian Revolution. Before the Revolution, Pipes’s hero Kornilov was sympathetic to the antisemitic Black Hundreds and during the war had talked incessantly about hanging “all those Guchkovs and Milyukovs.” But by August 1917, he had common cause with the liberals, as they both wanted to annihilate the Revolution. On the evening before his attempted coup, Kornilov told his generals, “It is time to hang the German agents and spies, Lenin first of all,” and vowed, if necessary, to “hang the entire membership of the Soviet of Workers’ and Soldiers’ Deputies.” Pipes contends that “The country yearned for firm authority,” meaning that the ruling classes’ desire to drown the revolution in blood represented the interests of the nation. Pipes blamed Kerensky for his “refusal to take resolute measures against the Bolsheviks,” but, in reality, this slaughterhouse solution to the Russian Revolution was bound to fail. Most workers refused to disarm, and the ruling classes simply did not have enough goons on the streets to make their dictatorial aspirations a reality. Kornilov’s (and Pipes’s) mass repression solution, however, reflected developments that underpinned Allied policy for the next several years. Despite public pronouncements about “democracy,” by December 1917, US president Woodrow Wilson started sending millions of dollars to various strongmen in an attempt to install a Russian “military dictatorship” — as Secretary of State Robert Lansing put it — amenable to American needs. Pipes’s following volume, Russian Under the Bolshevik Regime received much less fanfare. The Bolshevik villains were all too predictable. Pipes’s editor even allowed a zany essay on “Communism, Fascism, and National Socialism,” comparing the regimes of Lenin, Mussolini, and Hitler right in the middle of the text. The heroes are again Kornilov, who died a “tragic” death by a Bolshevik shell, and his replacement, Anton Denikin. Pipes clumsily apologized for Deniken, who “combined personal integrity with utter devotion to the cause.” Denikin’s troops would commit some of the worst atrocities of the Civil War, as Bruce Lincoln describes, including the infamous Kiev pogrom where defenseless Jews in “gigantic five and six-story buildings began to shriek from top to bottom.” Entire Jewish settlements followed the Red Army rather than facing the wrath of Deniken’s forces. In fact, it was Pipes’s colleagues from the Harvard Institute for International Development (HIID) who had convinced Yeltsin’ economic tsar, Anatoly Chubais, of the benefits of “shock therapy.” It was “desirable,” wrote Pipes himself in March 1992, “for Russia to keep on disintegrating until nothing remains of its institutional structures.” As Janine Wedel shows, this strategy quickly eliminated “most of the price controls and state subsidies that had underpinned life for Soviet citizens for decades.” Several years later, billionaire oligarchs (and Harvard Institute advisors) were among the few financial beneficiaries while Russian citizens were faced to deal with the largest peacetime decline in living standards in recorded history. Writing in the Nation, liberal historian William Rosenberg praised Professor Pipes’s “remarkable intellectual range, crystalline style and capacity to muster an extraordinary mass of evidential detail” but complained of “scholarship distorted by passion.” Yet Pipes’s scholarship was not distorted by passion, but by his extreme right ideology. Russophobe, champion of mass violence, admirer of antisemitic thugs, more dangerous a nuclear crackpot than the original Dr. Strangelove, and advocate for economic disintegration in Russia — this is how we should remember Richard Pipes. Kevin Murphy teaches Russian history at the University of Massachusetts Boston. His Revolution and Counterrevolution: Class Struggle in a Moscow Metal Factory won the 2005 Deutscher Memorial Prize.